What we'd like Texas and OU players to say in postgame interviews. Ah, read it while you can. Unfortunately this is the final Listoon. The newspaper is going start running my friend David Hopkins' strip "We've Never Met" weekly. Unlike Listoons, it's a serialized strip and they're making the move in attempt to get readers catching on to it. Good news for David and Chad. Sad news for me and Geoff... er, uh Stacy. I can never get that straight, I'm always unsure about where he/she is the transformation process. Anyway, it was a fun ride. Thanks to David, who got me involved. Thanks to Rob, my Editor at Quick for hiring me and thanks to Stacy for writing such entertaining stuff for me to scribble. Rob mentioned we may do one here or there in the future, so keep your eyes and ears open. 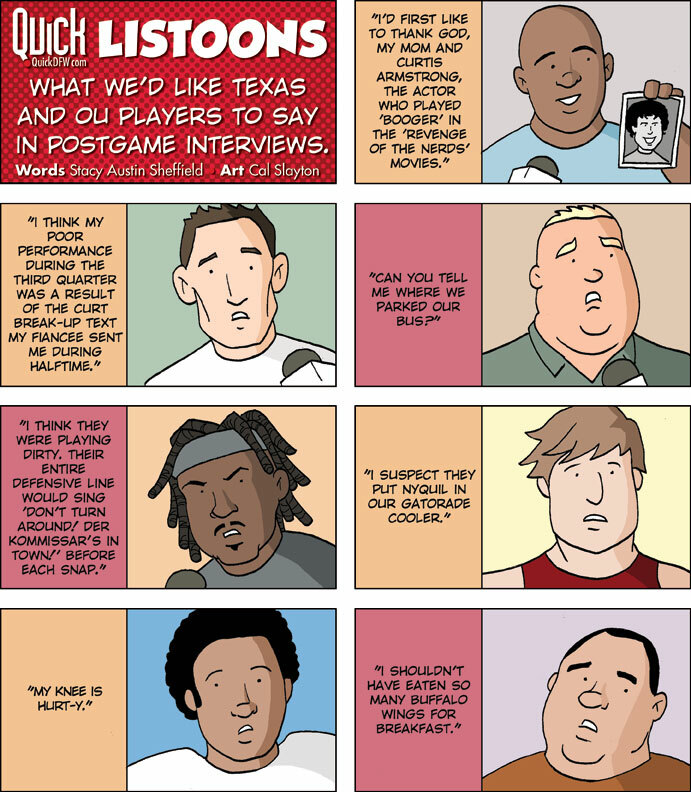 And now on to the Texas/OU themed strip. Go Hogs.